Keep your spring mantel earthy and serene. For the primary decoration, add moss, butterflies, and dragonflies to a grapevine wreath and hang it from a chipped old window with a piece of muslin. 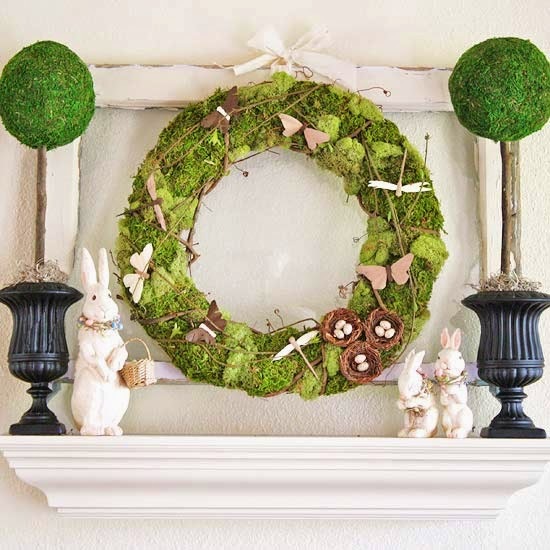 Add two moss topiaries flanking the wreath along with cute ceramic bunny figurines and your mantel will scream Spring! Here the wreath is made from rolled-up book pages, secured in layers, and attached to a green artist canvas. 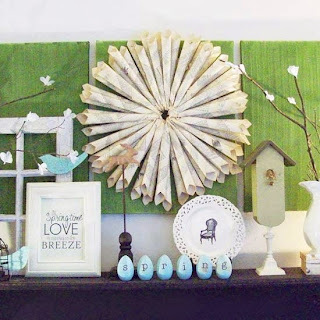 Infused in with the bright and fun colors to decorate the mantel for spring, are touches of blue with wooden eggs that spell "spring" and paper birds, and a wooden birdhouse and a few twigs with flowers finish the mantel with natural spring touches. 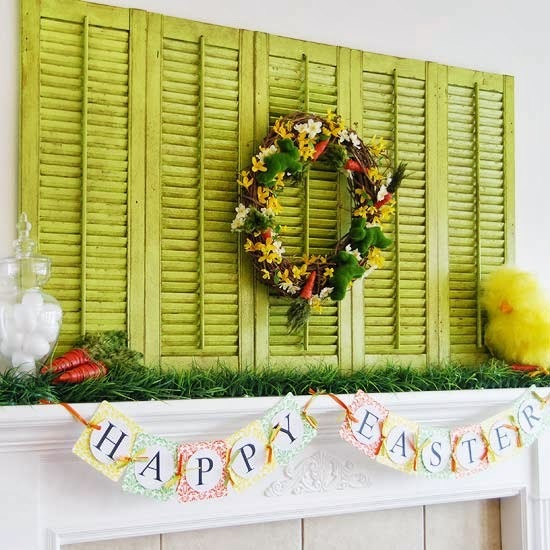 Lime-green shutters decorate this mantel year-round, and they work especially well with these Easter decorations. The mantel is lined with faux grass (available at crafts stores) and then added in are fake carrots, a chick, and an apothecary jar filled with white eggs. Spring touches added to a grapevine wreath like faux forsythia, more artificial carrots, and mossy bunny shapes, a colorful "Happy Easter" bunting fashioned by attaching white cardstock circles to orange, green, and yellow damask-pattern paper and vinyl letters attached to the cardstock spell the message tying it all together. 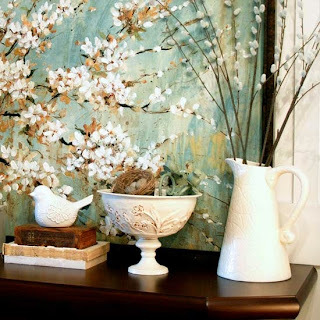 Simple colors are key on this spring mantel. 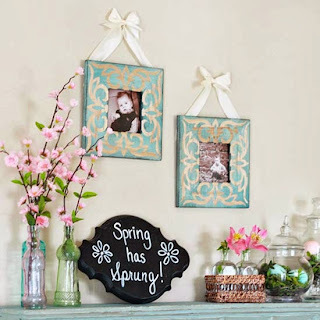 To complement the colors in the hanging picture frames, use light blue, green, and pink tinted glass bottles and add handmade cherry blossom branches. A wooden plaque sprayed with chalkboard paint displays a spring message. 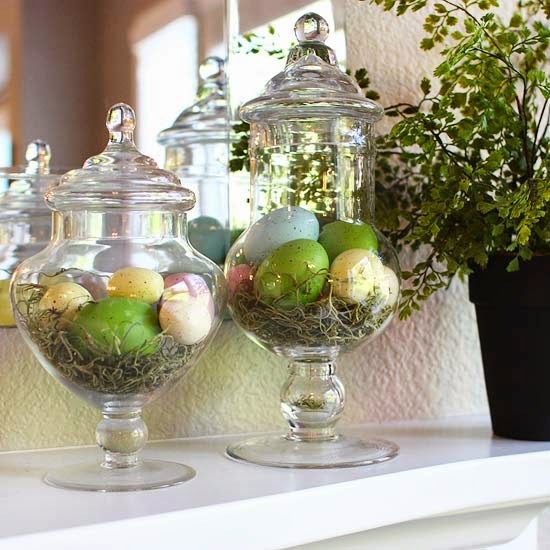 Glass apothecary jars are filled with greenery, sticks, and dyed Easter eggs. A small basket containing two glass jars with pink flowers completes the sweet display. An intricate footed bowl and pitcher to hold natural items, such as willow branches and a small bird's nest of tiny faux eggs pull the look together. Teal bird hooks also rest in the footed bowl and make excellent springtime props. 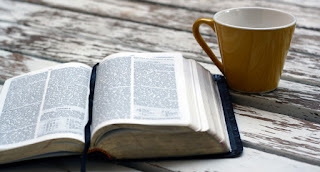 A white ceramic bird sits atop a stack of vintage books, and set behind the bowl and pitcher, a pretty piece of artwork with muted spring colors completes the vignette. 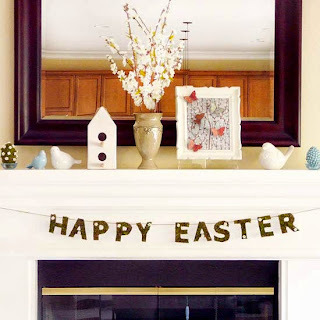 This decorated mantel for Easter uses a few easy crafts projects and some purchased items. To make the "Happy Easter" banner, cut block letters from sheet moss and glue them to heavy cardstock, spraying the letters with a thin coat of acrylic sealer to keep the moss from shedding. 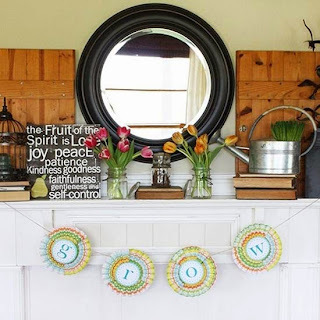 Embellish the letters with silk flowers, hot-glue them to twine, and hang them from the mantel with clear adhesive hooks. You can make the framed butterfly art by cutting butterfly shapes from pretty paper, attaching them to a wire, and slightly folding their wings up to give them dimension. 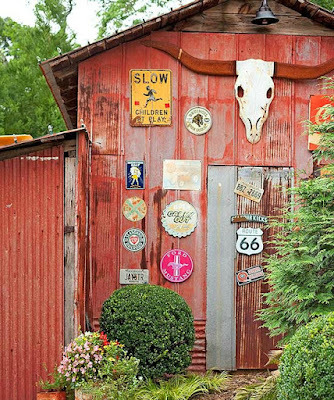 Ceramic birds, a birdhouse, and a flower vase complete the natural spring look. A tranquil color scheme pulls all of the elements of this Easter mantel together. 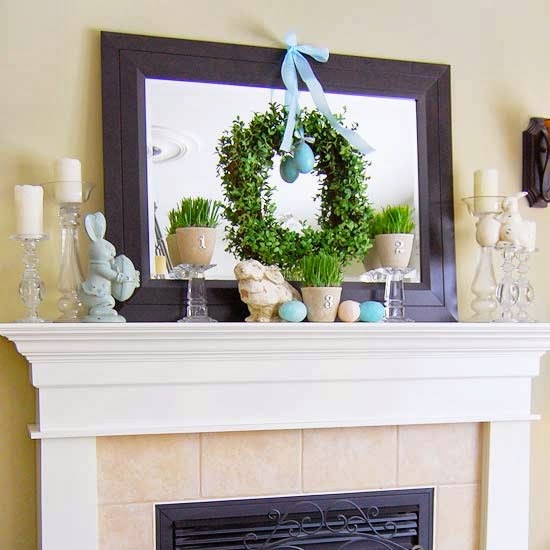 The boxwood wreath and a blue plastic egg are hung to a large mirror. Flanking the mirror with cream pillar candles on tall glass candlesticks, vintage bunnies in light blue and cream add to the color scheme, and potted grass completes the simple spring look. 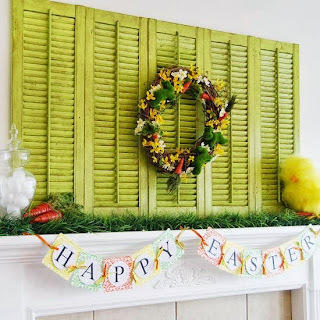 This easy Easter decoration adds a pop of color to this spring mantel. Find a half-dozen faux Easter eggs in pastel colors and place them in apothecary jars lined with straw to create this pretty spring decoration. Keet it simple on the rest of the mantel with neutral decorations, such as mossy green pillar candles, a twig wreath with greenery and white flowers, and a single potted plant. Old kitchen cabinet doors flank a simple black mirror on this spring mantel, which is simply decorated with pink and orange tulips in mason jars, a watering can stacked atop a few books, and word artwork. 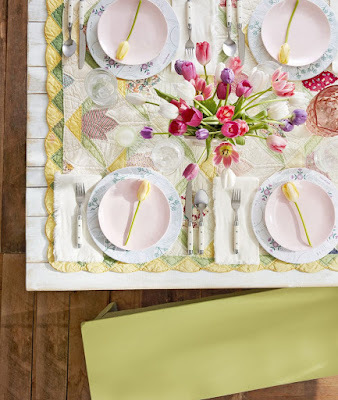 To make a spring banner like this one, cut four 8x12 and four 4x12-inch pieces of patterned paper. Pleat the 8x12 pieces, then pinch in the center and fold in half. Hot-glue the edges together to form a fan. Pleat the 4x12 pieces, and glue them to the fan shapes to complete the circles. 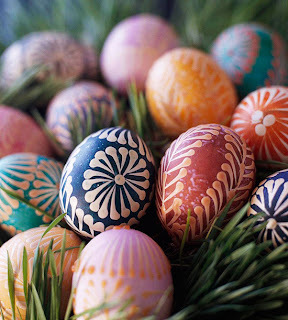 Using a die-cut machine or decorative scissors, cut four circles from white cardstock. 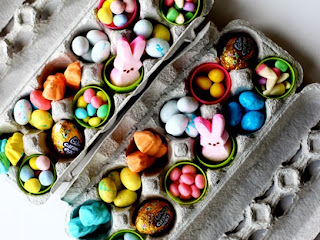 Mat them with cardstock and then cut in a circle. Use a stencil or die-cutting tool to make colorful letters to spell your message. Punch holes in the circles, string together with twine, and hang.